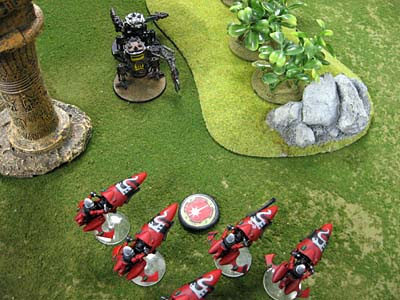 Here are my jetbikes after making a Turn 5 objective grab. I got a chance to play 2 small, 500 point games last night against Orks. It didn't take long for me to learn a couple of lessons. 1. I'm not that good in hand to hand, in fact... not good at all. 2. My Vypers can put out a tremendous amount of firepower each turn. 3. I need to use my higher than average movement to stay out of range. 4. Cover saves are my friend. I felt a lot like Luke Skywalker the first time he picked up a lightsaber. I know that I've got a good army... I just don't know how to use it just yet. And Space Marines have it good, I don't care what anyone says. As a follow-up: Here's the link to my third game. "And Space Marines have it good, I don't care what anyone says." hee hee. this makes me chuckle every time I read it. I've heard it most every time a primarially SM player picks up a more fragile army. But you're right. on both SM's having it easy, and that Eldar are a good army. They have very different playstyles though. I hope you enjoy their shiny, shiny, boots. If I hadn't fallen in love with burning Heretics in the =I=, I'd have shiny boots. I still have problems not thinking of Eldar as Space David Bowies. Like Ziggy Stardust mixed with the Goblin King. I'm enjoying seeing your new force come together. Keep it coming! Space Marines DO have it good. I play a good 6 armies now (soon to be 7 with IG codex coming out). SM's are just so resilient that the army allows for greater flexibility. The same tactical mistake in another army could be far more devastating than for SM. It should not be suprising that you are not good at assault especially against orks at 500 points. 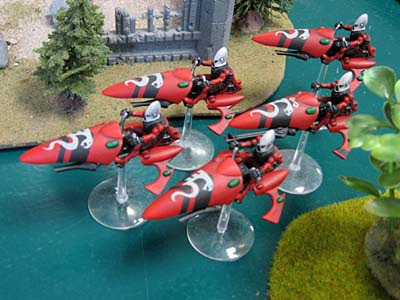 An charging eldar jetbike is pretty even with a shoota ork recieving a charge, but they will outnumber you three to 1. As long as you keep moving and isolate and destroy units they cannot catch you in assault range with 18 inch gun range and a 6 inch free assault phase move. Good to hear what you learned already, i'm sure your bikers will get easier to play. also one of the strengths of your list is your bike council. they provide some serious survivability. turbo boost for that 3+ save w/fortune on em and a few destructor warlocks and your opponent cannot ignore them.. I'm hoping to get a handle on the basics at 500 points. Things like movement and planning for 5 turns and so on. Target priority and selection are big too. I know that adding other units at higher point levels will give me more abilities but this army plays completely differently from anything else I've ever fielded. I think you've got the right idea for starting to learn a new type of force, Ron. I know from my experience, starting with smaller points helps you to learn some of the fine points of an army. It's tempting to zip past the basics and try to use the "cool toys" in larger matches. I find that people who go start with large matches so they can use the toys, typically RELY on the tricks, and if those tricks are nullified, they loose easily. Troops became an underestimated force. If you can use your troops highly effectively, your 'toys' become more effective when properly supported by your troops.